b) splint at birth then check progress at the 6 week scan. Unfortunately the paediatrician who checked Zoe over prior to going home decided on the former and we had no idea there was something very wrong with Zoe’s hips until the 6 week ultrasound. Once we had an appointment with the orthopaedic surgeon he was not happy she was not splinted at birth. As it turns out there may have been no improvement with earlier splinting. However, it would not have hurt and we will never really know for sure if surgery could have been avoided. NEW BABY TIP - if your baby has clicky hips at birth - insist on further investigation as soon as possible! We were told early treatment is crucial for a non-surgical outcome. DEALING WITH THE PAVLIK HARNESS - We do not have any photos of Zoe in this splint but we remember it very well. 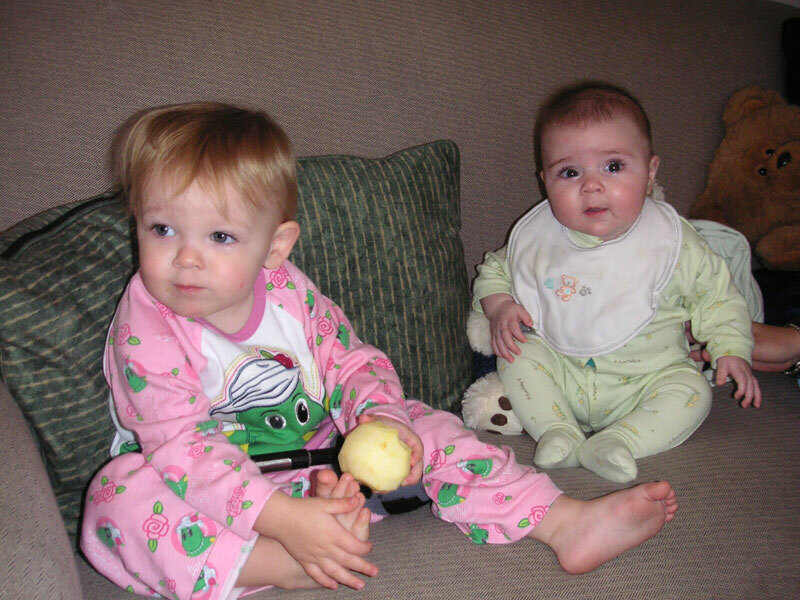 Change nappies often to prevent leakage as the harness fabric stains easily. We put one size bigger clothes on her so it covered everything (it was winter). Baby's legs should not be able to straighten. If in doubt get it checked with the occupational therapists who fitted it. Zoe wore a Pavlik Harness from 6 weeks until 12 weeks of age. This splint is worn next to the skin and cannot be removed. So she could only be sponged bathed and winding her was a challenge. We don’t have any photos of her in this splint as we were having a hard time coming to terms with it all and didn't think to keep a record of her progress. It was then decided that the Pavlik Harness did nothing (but make our life a misery) and surgery at 16 weeks was booked. She had a closed reduction and then placed into a splint called the Von Rosen. In a closed reduction the surgeon manipulates the thighbone (femur) so that the ball (femoral head) is placed in the socket. Sometimes a tendon in the groin area, the adductor tendon, needs to be lengthened to ensure that the femoral head is placed in the socket correctly. Following 6 weeks in the Von Rosen she then wore a Denis Brown splint for a further 6 weeks. 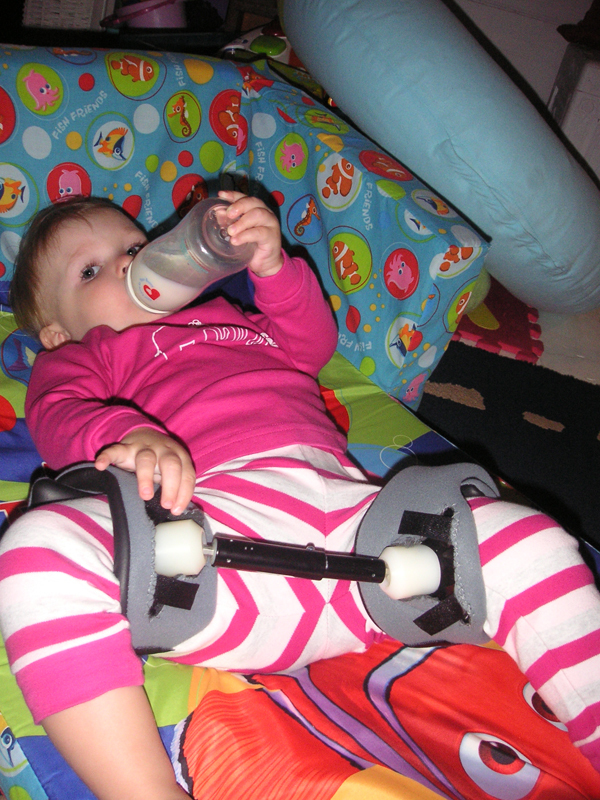 This splint was ok except it pinched her rapidly growing thighs and needed adjusting regularly. 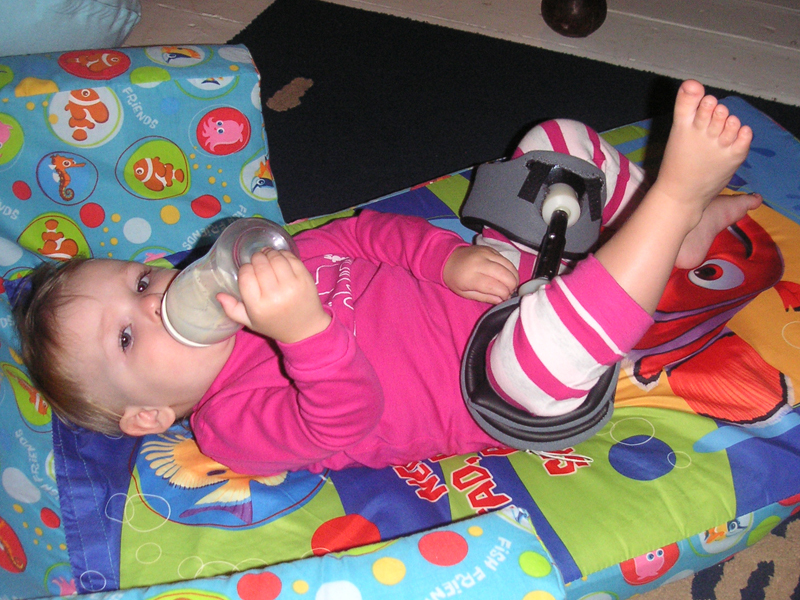 She also learned to sit up in this splint with some pillows to prop her up. She could go in the bath too but it was a tight squeeze. It was just easier to take her in the shower with us. After this her x-rays revealed her left hip was not going to develop on its own. Our surgeon took the splint off and we were told she would have major surgery at around 18 months of age. Of course it was postponed for a couple of months due to a new addition to the family. 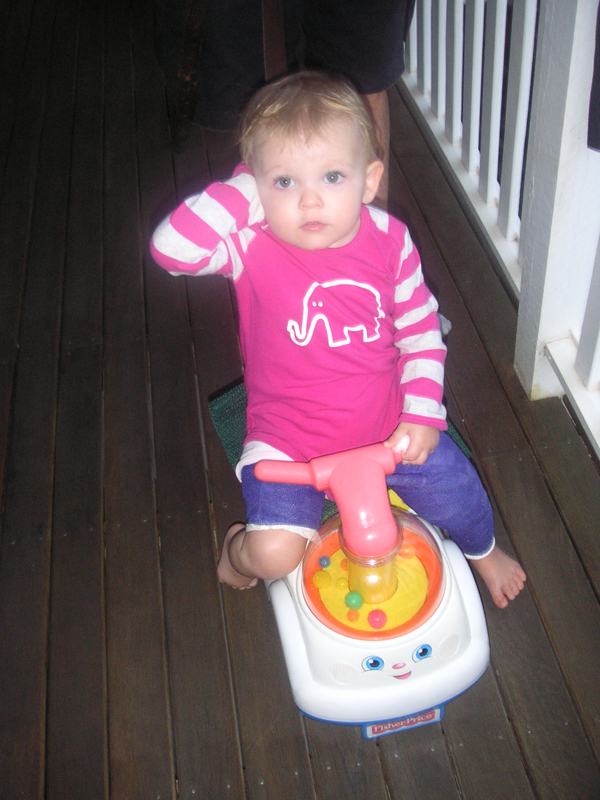 Zoe in the Denis Brown splint and five months of age. 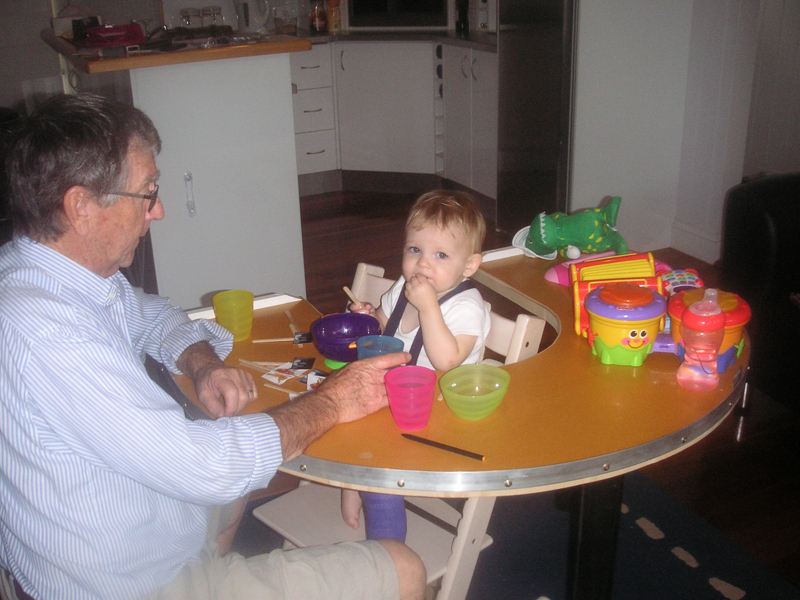 We were able to use the harness that came with the high chair so she could comfortably sit at the table. It is a Stokke highchair. 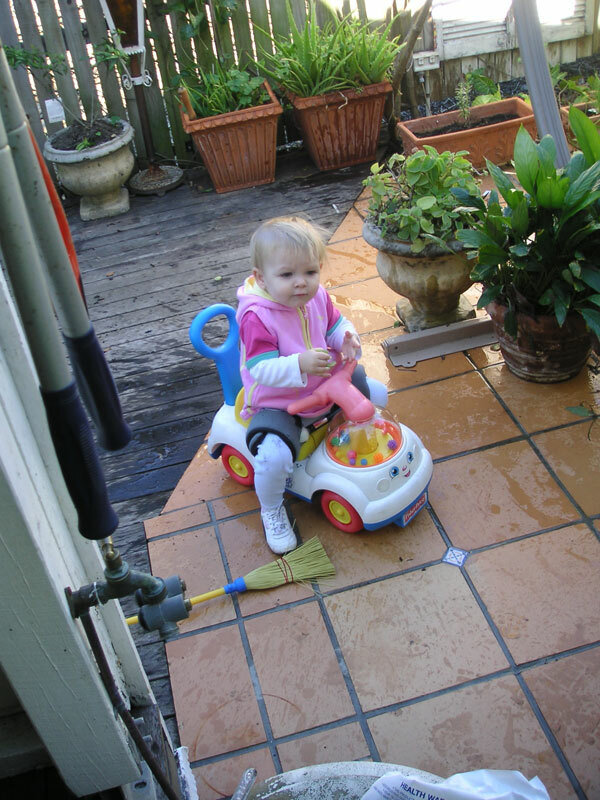 She could also sit in the pram well too with a foam wedge at the back so her legs would sit over the front of the pram. 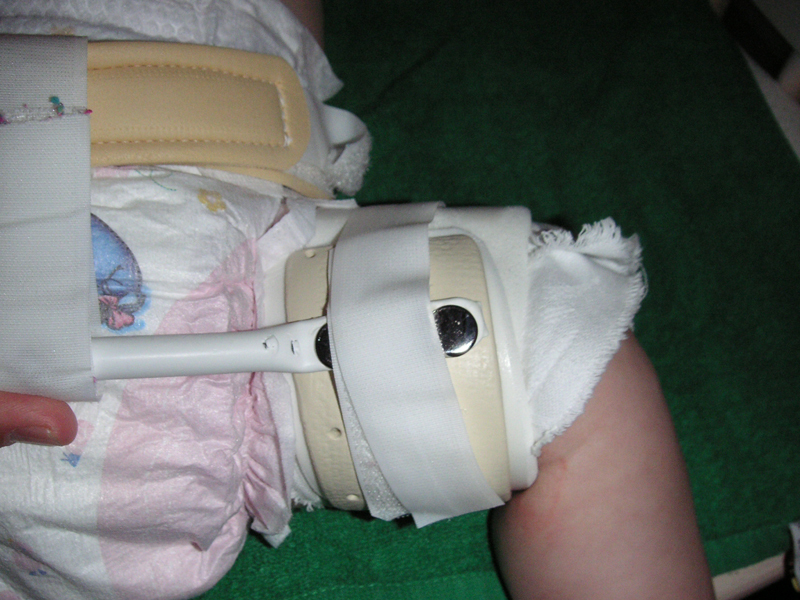 DEALING WITH THE DENIS BROWN SPLINT - These images show how the cuff sat on Zoe's thigh. We had to line it with some cotton fabric to make it a bit more comfortable for her. Baby Legs (leggings with no feet) would work very well too but we didn't know about them at the time. We also put skin-like dressings (Comfeel or Dewiderm) on the back of her thighs where the splint would dig in and rub the skin. This dressing stays on for days at a time. We only took the splint off, one leg at a time, to dry it after a shower. This is our little girls after her major surgery. It broke our hearts to see her like this but we knew it wouldn't last long. It was not easy coming up with new things to keep Zoe entertained. She would get so frustrated and yell a bit and sometimes only the Wiggles could fix her woes.This trike was a good buy. It only needed some extra padding and a bit of non-slip fabric and Zoe was doing laps of the neighborhood. Her feet did reach the pedals but only one foot could move so it is lucky it is not a fixed wheel.More than anything Zoe loved to be out of the house on her trike, in the pram or in her stroller. We just had to make sure we took enough snacks to last the trip! The cast was not as bad as we were expecting. 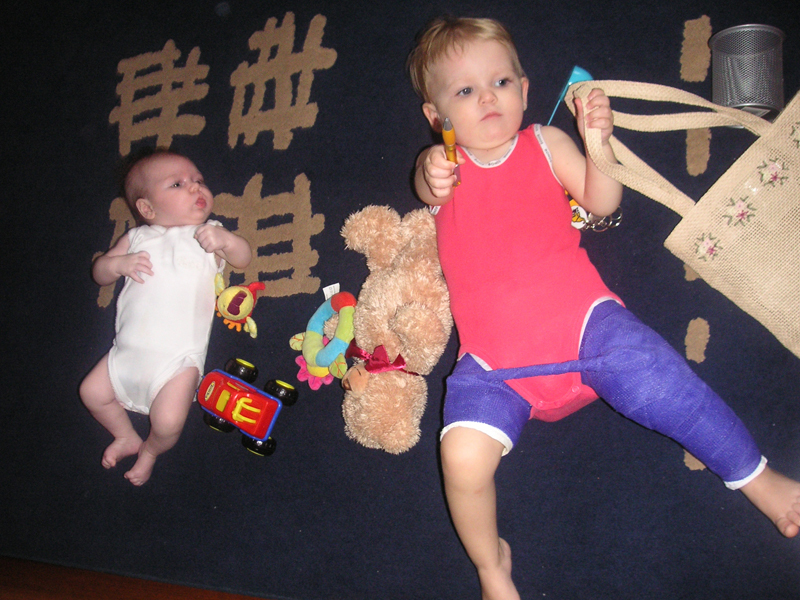 We used newborn nappies with toddler nappy over the cast. A sanitary napkin was used at the top of the cast as padding for her belly and to absorb any moisture. Zoe laid on her back a lot for the first few days but was quickly bored. We did not encourage this but one week before the cast came off, she figured out how to stand up. We stay close by in case she fell though she seemed pretty stable. We did have to tell her not to walk as she thought she could just get up and go once she was upright. It really was not a very nice time but it was not forever. The biggest thing we learned was the cast had to be kept as dry as possible also keeping it dry was almost impossible. We were very careful with Zoe's diet and there was only one messy explosion. Unfortunately it happened in the first week and there was nothing we could do about it. Make sure there are HEAPS of wipes on hand and change nappies frequently. At night we were told to make sure she was turned so she wouldn't develop pressure sores inside the cast. We did that for the first few nights but after that we got sick of Zoe yelling at us and gave up. She slept 12-13 hours most nights and after about 2 weeks managed to learn how to turn herself over. We used a piece of foam shaped into a wedge in her pram a smaller wedge for her car seat. 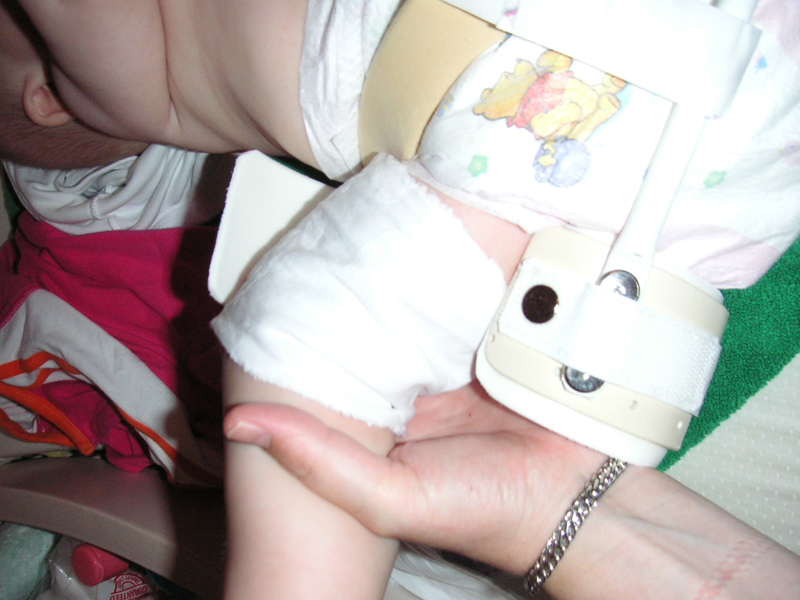 The high chair harness was used again and we put another small wedge under her bottom to tilt the cast forward. Zoe learned how to walk in the splint after 3 weeks. Then she was running. 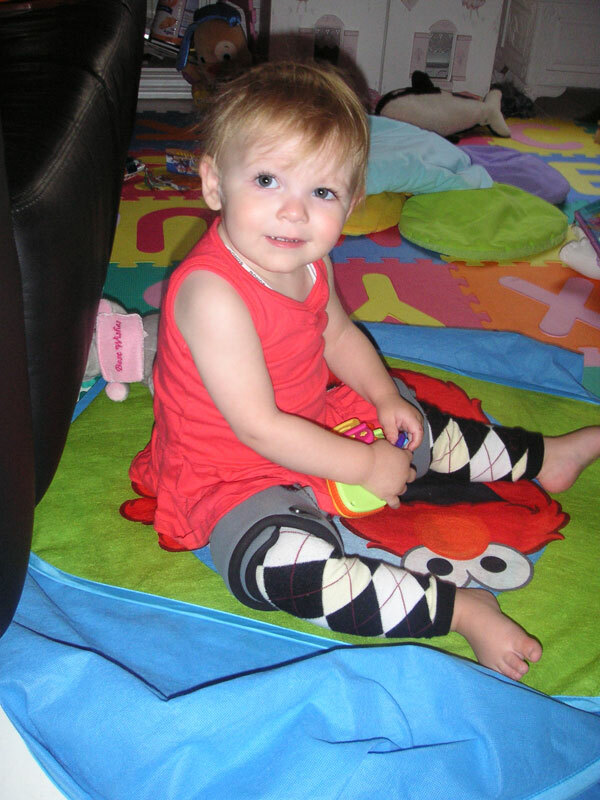 The Baby Legs (leggings) were much better to wear than pants as the weight of the splint pulled her pants down. When her cast came off, we were all very happy. However, the process of taking the cast off was not a nice time. It was just horrible hearing her scream so much. There was a TV above her bed with the Wiggles playing and her she started screaming for Dorothy as if she was going to take the pain away. We thought about taking a photo of the cast but it was far too traumatic to get the camera out. The splint was a bit tricky to keep on. Zoe had become much more active and it slip down her leg constantly. We stayed close to fix it up so she didn't trip over it. In the 2nd week, she had a meltdown over the splint when she managed to get all the way out of it and across the room before we noticed. She yelled at us "Off! Off!". But it went back on. After 5 weeks it started to fall apart and she learned how to take it off and run away yelling 'pint off!'. The splint was not waterproof so we still couldn't take her in the shower. It was very tricky to change her nappy and give her a wash. This splint was on for 6 weeks. It was much better to deal with than the cast. Zoe was able to get around on her popper and she was a changed kid from the sullen, cranky monkey in the stupid purple cast. In the final week of wearing the splint we started to see the wonderful Zoe who was with us before the surgery. The experience took the wind out of her sails for quite a while. This is our little monkey running around again, two months before her second birthday. The doctors were quite happy with the surgery results and are confident that her hip will now grow normally. Six months after the surgery and 3 months after the splint comes off she will have the wires (that held her bone grafts together) removed. It will be day surgery and we don't expect her to slow down much afterwards. Zoe's day surgery is not too traumatic for any of us. The wires were successfully removed and we took our hungry girl home late in the afternoon. Poor Zoe was quite drowsy from the anaesthetic though still in good spirits once she had a small snack. On the way home we hear a little voice from the back seat...'It's a beautiful day Mummy'. This memory still makes mummy cry happy tears. 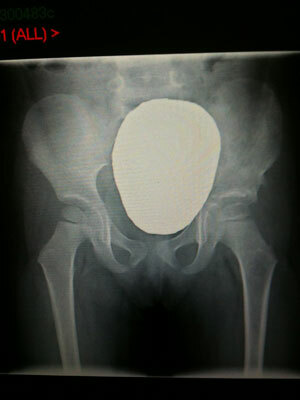 The image of Zoe's hip prior to the wires being removed. Yesterday we saw Zoe’s orthopedic surgeons. In between Zoe’s hysterical screams we were told her hip was fixed. They are very happy with how the bone graft has taken and how the shape of the hip socket is very close to perfect. This means we now have to visit the hospital for six monthly check ups probably until she is about 16 years of age. Needless to say we are very happy with this news. 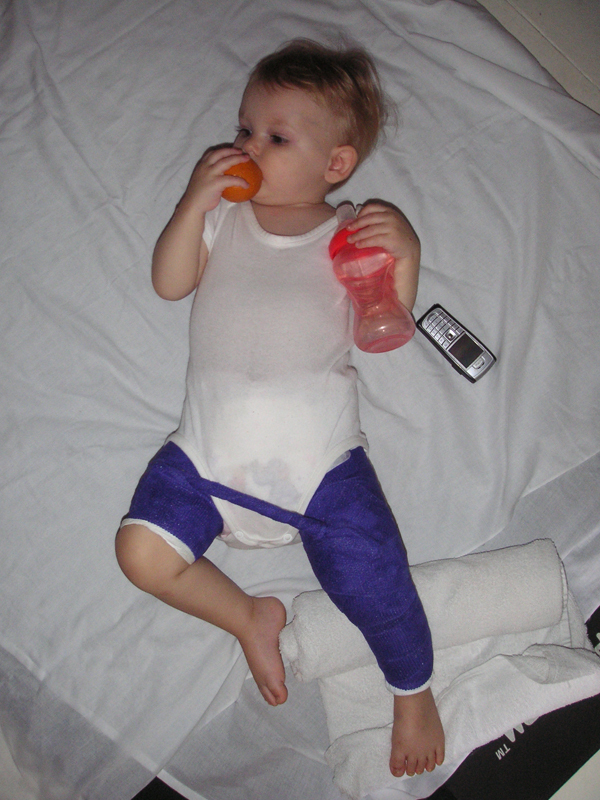 Months of splinting, surgery, more splinting followed by more surgery, a cast and further splinting – was all worth it. She probably won’t remember any of it and she will develop and grow just like every other girl her age. For those of you reading this and going through similar treatment on your little one - please email us with any questions. There is very little support out there for parents dealing with this disease and we are happy to share our experiences and lend a shoulder. Below is our Zoe one year after her pelvic Osteotomy. She is a very happy and normal nearly-three-year-old and the light of our life. She is fascinated seeing photos of herself in the cast and we think the memory of that time is fading fast. Her personality did change for quite a while following the time in the cast and splints. However, 12 months on she is coming out of her shell and while she is still very sensitive she seems to have come through all of this without any emotional scars. This is the best possible news we could have heard. Looking back when Zoe was first diagnosed, we could not imagine reaching this point in time and being so happy with her progress. In the early days it was so hard not to get caught up in the daily struggle with being new parents as well as dealing with splints and surgeries. Zoe is now on the path to her dream of becoming a ballerina and doing ballet every Saturday morning. We also take her to swimming lessons and she is a very active kid. She has no physical ill effects from her hip dysplasia and unless we mention it, no would could ever know. We are still not sure how much of her sensitive nature is innate and how much is from her time spent immobile. It doesn't matter though as she is turning into a balanced little person. Above is her fantastic X-ray from February 2010. This is Zoe's latest x-ray. The surgeon was very happy with how her hips are growing and he expects her to continue to make a complete recovery. Her next check up is when she turns ten, June 2016. 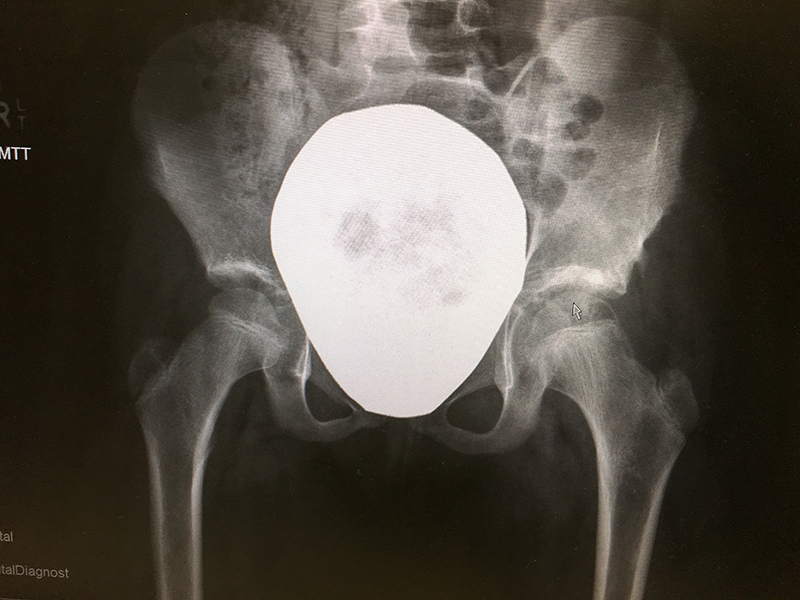 Zoe's latest hip check went well and the X-ray shows perfect growth. You can see on the X-ray below, there is a slightly thicker white area above the mouse arrow. This is the bone graft and it has formed well to cover the top of the femur. She complains at times about a kind of numbness down her left thigh, below her scar. The surgeon thinks this may be due to some nerve damage during her last surgery and if it is causing her no pain, it is nothing to worry about. The thing Zoe looks forward to when it is hip check time, is a day off school (which the whole family gets now that we home educate!) and a trip to the pancake shop. Unfortunately that shop closed some time in the last two years so we went to Max Brenner instead. It was a real treat to spend some time with my eldest child and to marvel at the amazing young woman she is becoming.